The Florida football team returned to the practice field on Wednesday for the first time since winning the BCS Championship Game. Gator Country was there to capture all of the action. Here’s a gallery of images, offered as a free sample for this week only, to let you see for yourself what the 2009 Gators will look like. Gator Country photo galleries are legendary for thoroughness and high quantities of the best in professional sports photography. More images will be added to this gallery overnight, so check back to see more! 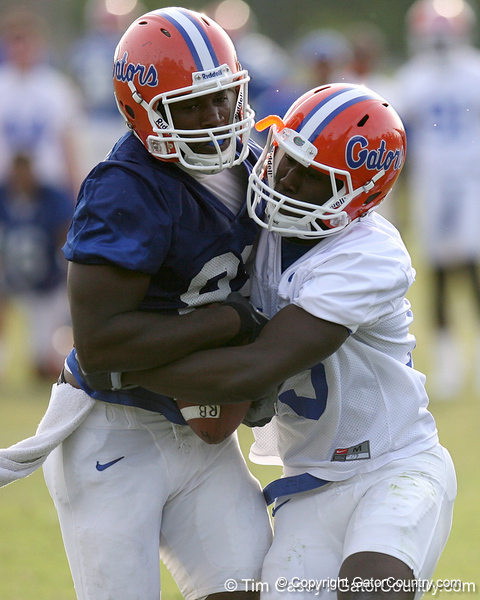 Frankie Hammond, Jr. and Ahmad Black work out during the Gators' first day of spring football practice on Wednesday, March 25, 2009 at the Sanders football practice fields in Gainesville, Fla.